Steven Rattner is known in New York circles as an operator. He has had his ticket punched as a student at Brown University, a reporter at The New York Times, a partner at Lazard Frères and the Quadrangle Group, and a member of several think tank boards. He is also a loyal Democratic fundraiser, and a denizen of Martha’s Vineyard, where he first met Barack Obama. He is as blue as blue can be. That pedigree, despite its lack of automotive or manufacturing experience, brought Rattner to Washington in early 2009. Assignment? Prevent the implosion of General Motors and Chrysler. For anyone who can’t quite remember that far back, by the end of the Bush years both companies were hemorrhaging billions, about to financially flatline and be cremated in bankruptcy court. Rattner headed “Team Auto,” the Treasury Department task force that arranged the taxpayer financing and, to date, survival of the two auto icons. Because Rattner is an operator, he has followed the prescription of Winston Churchill, who at the end of the Second World War said “History will be kind to me, for I intend to write it.” Churchill did—six volumes. 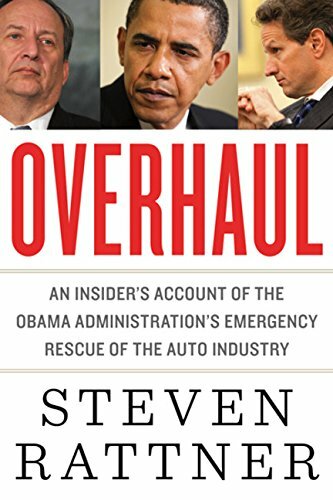 Rattner, however, has been more merciful with his stake in the ground: At three 336 pages his memoir Overhaul: An Insider’s Account of the Obama Administration’s Emergency Rescue of the Auto Industry will not win the Nobel Prize for Literature, as Churchill’s did, but it is more readable. It is also the first “tell all” to be published by an alumnus of the Obama administration. One has to wonder, however, how certain people depicted in the book as difficult—(task force teammate Ron Bloom and Fiat chairman Sergio Marchionne), out of touch (GM chairman Rick Waggoner), or simply out to lunch (GM’s chief financial officer Ray Young)—would have acted if Rattner had informed them with the first handshake that any and all interactions would be fodder for a future book. Of course, a former reporter-Democrat heavyweight-financier appointed to overhaul your company would probably be most chief executives’ worst nightmare anyway. But as Car Czar, Rattner seems to have assembled a capable, driven team that analyzed the automakers’ plight, confronted them with the authority of the federal government, restructured and financed them and, for the moment, left them as viable entities—although only the future will really tell whether it was worth the trouble. Just to make clear the heroes and the goats, Rattner hammers away at the management disaster that was GM, a company in such disarray that its financial systems couldn’t produce such basic items as an accurate monthly cash flow or a list of the banks in which the company had cash. Rattner himself spent more than $400,000 in legal fees just to pass the vetting process and work for the government as an unpaid volunteer. In many respects, his experience will not bring more talent into the nation’s institutions. Time after time he tells about the difficulties of day-to-day life in the bureaucracy, whether it’s reserving meeting rooms at Treasury or dealing with the bevy of prima donnas we call the Congress. Again, only time will tell whether the taxpayer bailout of the auto companies made sense. The same holds true for Rattner’s legacy. Rattner was implicated in a still-unresolved New York State pension fund “pay to play” scandal while he headed the auto task force. Though he is smart enough not to say anything material about it in the book, he acknowledges that it hastened his own exit from the administration. But let’s give him his due: Rattner can write, and Overhaul has plenty of juicy morsels for those who enjoy Peter Drucker, Bob Woodward, and Kitty Kelly. Robert Nersesian has spent his career in public relations, working for or advising Fortune 500 companies. He is currently president of the consulting firm Public Advocacy Associates, LLC.